The foreigner who enters Spain with heart and mind open begins immediately to enjoy the Spanish sun and the Spanish joy of living that transcends the economic insecurity. The foreigner can accept these things freely because he feels no sense of responsibility about his enjoyment. This feeling may last for several months, but at last he begins to sense the tremendous price that Spaniards have paid for their delicious anarchy, and then the visitor is saddened. He becomes frustrated and feels the sharp threat of despair. Then he too begins to realize that the Spanish alegría is always permeated with a deep sadness, the natural outgrowth of la lucha por la vida, the struggle for life. The traveler may repeat to himself that it is not his responsibility, that it is not his country, that these are not his people, and that he has nothing to do with bringing into being the restless enigma that is Spain. Yet all the while he will feel sad down deep inside, and he will realize at last that even the songs and dances of Spain are all sad songs. There is nothing really gay or picturesque about Spain when one sees it long enough to penetrate the mask. 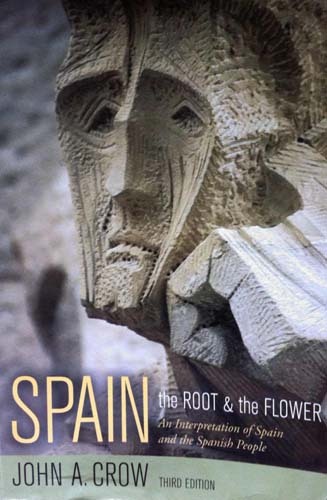 There is no such thing as “romantic” Spain, which is the superficial reaction of a few visitors who never get to know either the land or its people. Spanish culture was always a fruit or a flower that came from a garden which promised even more, but, lacking the proper cultivation, went wild and died. For the past several hundred years the history of Spain has been that of a dying garden overgrown with weeds.